Everyone loves archery. But most of us don’t have the time or money to set aside a few hours every week to get to the archery range, rent a bow and arrow set, and get in our target practice. Well, now you can get in a few daily rounds of hitting that bullseye with the Dark Knight Bow mini crossbow. 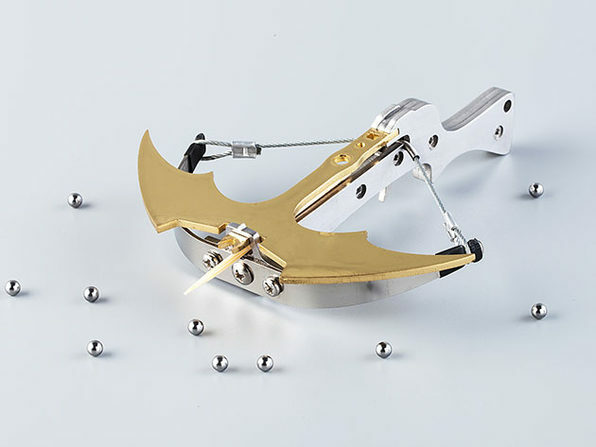 This amazingly portable mini crossbow brings the target range right to your home. Measuring just under five inches long, the Dark Knight is the perfect pocket-sized bow for shooting toothpicks, Q-tips, matches, and other small projectiles. The bow is designed to store multiple toothpicks in the chamber, so you can have a whole firing session without having to reload. Made of handmade stainless steel, the Dark Knight Bow will last for a lifetime of target practice. When you can’t get to the archery range and just need to practice your precision firing, look no further than the Dark Knight Bow. Just a few minutes of practice every day, and you’ll be hitting bullseye after bullseye in no time. Get the Dark Knight Bow carry mini crossbow for $25.99, a savings of 35%. Save an additional 10% with code MADMARCH10.